Greetings from the tundra! I know this will come as no surprise to just about anyone living in North America right now, but winter continues to pummel us here. Then it picks us up, dusts the snow off our pants, and throws us in a snowbank. The kids are home from school again today, making it the sixth day of weather related school cancellations. I continue to bake my way through this winter and even the Frozen soundtrack, which usually brings such joy, seems to be taunting me. I'm going after that Elsa myself! In my sketchbook it's all spring and flowers though. 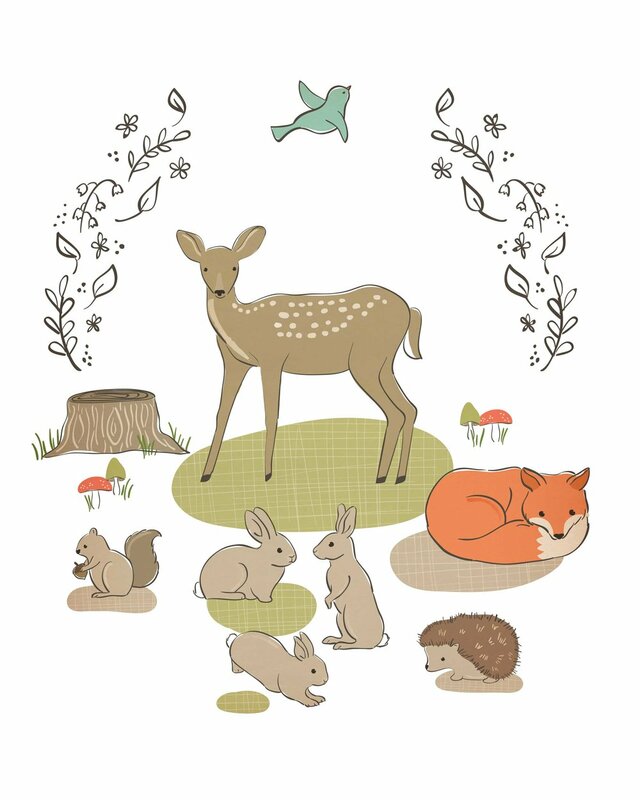 I've really fallen for the woodland animal trend, which I know is nothing new, but those little deer and foxes are just so sweet and peaceful you can't help but love them. It's like an exercise in meditation drawing them. So I've got a woodland animal print and a pattern that I've been working on this past week. Little rabbits are so cute too - of course these little rabbits don't eat the bark off all my shrubs. But I love the idea of walking through a quiet wood in the springtime. Makes me feel like a Disney princess. Or something. Hope you like them. The pattern below will be in my Spoonflower shop once I proof it. And the print will be in my (hopefully opening soon) Etsy shop. Stay warm, stay hopeful, stay away from the mixer.